Two years ago, my life, the lives of everyone in my family, and the lives of the 90,000+ people who have viewed our son’s blog over the last 2 years, were forever changed. In a dark exam room, after an excruciatingly long ultrasound, you softly told me “your baby has a severe heart defect.” The landscape of my life was forever altered. 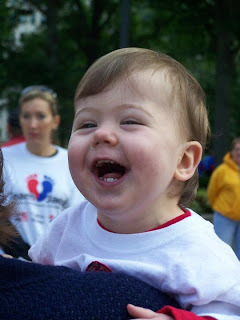 A year ago, I wrote you a letter showing you how our son had defied the odds, was living and thriving despite the prenatal prognosis you gave us on October 1, 2009. 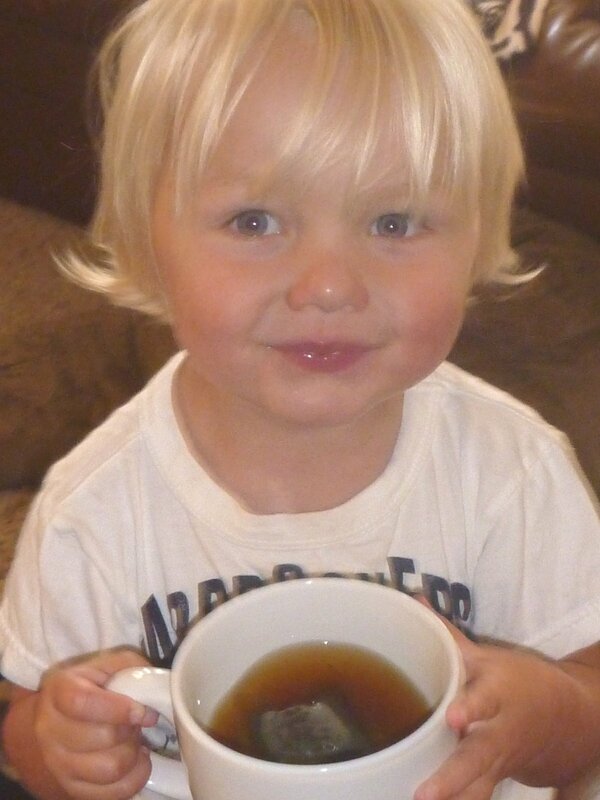 As we approach October 1, 2011, the 2 year anniversary of my son’s diagnosis, my mind is swirling with emotion. If I was full of hope when I wrote you last year’s letter, Dr. Rotmensch, that hope is overflowing this year. One year later, my son is stronger, happier and healthier than I could have imagined even a year ago. And one year later, I am wiser, more determined and more proud of my son than I can even put into words. So, once again, I write to you on the anniversary of his diagnosis. To raise awareness. To give hope. Will I do this every year on his anniversary? I don’t know. If I’ve learned nothing else the past 2 years, I’ve learned to stop making concrete plans. ;-) His diagnosis gave us the freedom to just live in the present. The present is that my son is doing incredibly well. In my letter last year, I described my son as a typical 7 month old boy – “he smiles all the time, blows raspberries, laughs at his big sister, rolls over, chews his toes, puts anything and everything in his mouth, and pretty much does everything else a heart healthy 7 month old baby does.” Today, at 19 months old, we describe him simply as “a tornado with legs.” He moves at lightning speed and is fearless. He climbs (and climbs and climbs and climbs), he jumps off things and tears things apart. He is ALL boy. His energy level is unreal. He never stops. I can hardly keep up with him. He is talking a mile a minute (and most of it we can actually understand). He is such a funny little guy. People who don’t know about his heart defect will often tell me what a cute busy guy he is. Sometimes I tell them about his heart defect, just to see the look of shock and amazement in their eyes – and to feel that familiar sense of pride that swells within me. And sometimes I don’t. It will be his story to share someday. HIS story, that, by the grace of God, we gave him the chance to tell. I don’t think I need to say it, but he is THRIVING. Make no mistake about that. 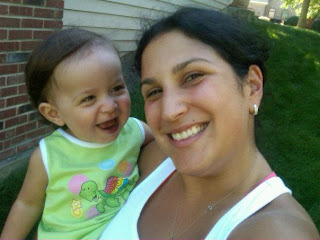 During my prenatal appointments with me, you often talked about his quality of life, that it might likely be diminished. Let me tell you, that is the running joke around our house these days – this kid, who is smarter than a whip and running around laughing hysterically and loving life has no quality of life? Fat chance. 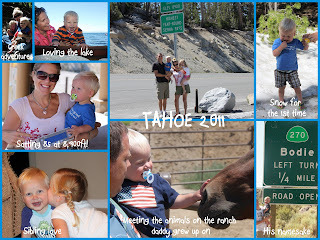 These pictures were taken at Lake Tahoe, where we took a 10 day vacation this past summer. Yes, Tahoe. 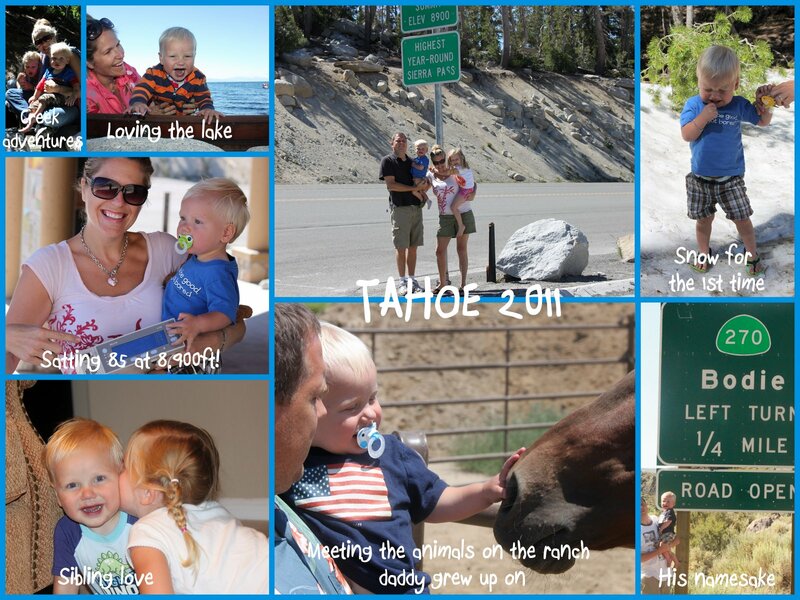 As in 7,000ft+ Lake Tahoe. He did amazingly well. You know, the further I get into this journey with my son, the more moments I have with him, moments I’d have missed if I’d chosen to terminate, and it makes me more and more sad that so little hope was given to me at the time of diagnosis. I was so I incredibly lucky that Nancy Kim happened to be in the office the day of my diagnosis, because she was the ONLY one who gave me any hope. It makes me so sad to think of parents walking out of your office without that same opportunity. It’s not that I blame you for discussing termination right off the bat – based on your knowledge of HLHS, I can certainly understand why you assumed I would choose that option. But it wouldn’t have been fair, because my decision would have been made based on only half the story. You personally know about the complications these kids can face and the tough outcome that many do face, but what you don’t know about is the extraordinary number of these kids who fight past the complications to live happy, normal lives. Yes, it’s scary (believe me, the fact that my son still has at least one more open-heart surgery looming on the horizon has kept me up many a night), but on the other side are kids who play sports, and go to college and get married – and have normal lives. That side of HLHS is kind of a big part too, don’t you think? 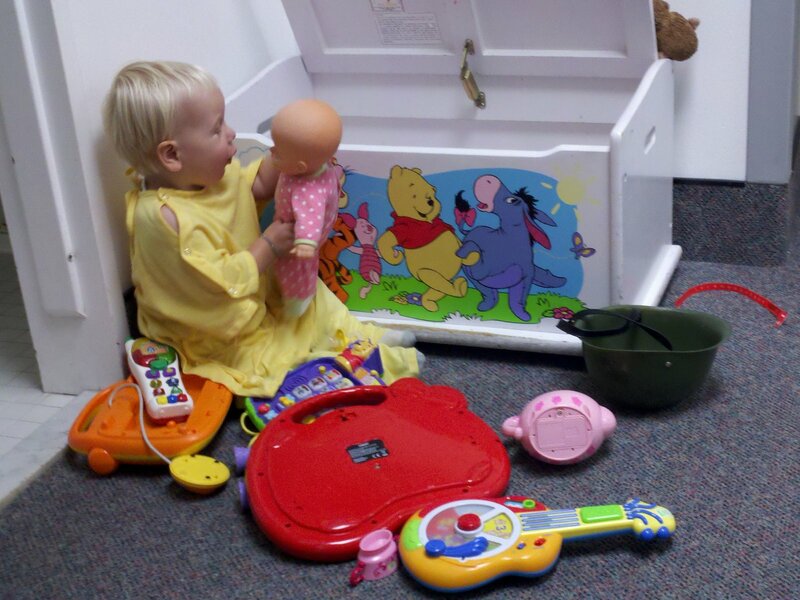 A part newly diagnosed parents also have the right to know about before making any decisions. Knowledge is power, right? In the past year, along with 8 other heart moms, I started a nonprofit, Sisters by Heart, to reach out to newly diagnosed HLHS families, to combat some of this one-sided advice new parents were getting. Many, many newly diagnosed families had similar experiences with their perinatalogists, where termination was discussed and all of the attendant complications of an HLHS diagnosis, without any real discussion of the very real chance that their child could make it through all of the complications and lead a VERY normal life. We don’t downplay the complications (it is a very serious diagnosis and does take the lives of way too many sweet children), but we do try to provide hope as well as the reality that a lot of kids are thriving despite the diagnosis. We reach out to these families, and provide care packages with hospital necessities, as well as bios and pictures of our kids, most of whom are doing quite well. Just to give the parents another point of view. We have already given out care packages to over 100 families all across the United States. You’ll be interested to know that, since we track on the families we send packages to, we know that the vast majority of these 100 children are thriving despite this diagnosis. Word is getting out about what we do. Our brochures are now in major cardiothorasic centers across the country. We’re starting, one family at a time, to change the landscape of how HLHS is perceived. Our hope is that, someday, every single family given a diagnosis of HLHS will be told not just about the gravity of the situation, but will also be given one of our brochures (of which I am enclosing a few), and told that there IS hope. My son, and so many others, are living proof of that. So Dr. Rotmensch, please, when you have another new family facing this diagnosis, yes, tell them how serious it is. Tell them how risky it is. Tell them that the first year will be beyond horrific. But then, hand them our brochure, and tell them there is HOPE. There is another side. These parents need to know that, for their sakes and for their unborn HLHS warrior’s sakes. Please help us to spread that hope. So Bodie and I got there, game face on, ready to do this. They led back to the waiting room and all he knew was that he WANTED to go. So, naturally, he stood right in front of them, just waiting for them to open...into him. Best part was that they opened automatically, so he got knocked down more than once. Oh, and we spent some time picking up all of mommy's belongings that he had thrown all over the floor screaming "NACK! NACK! NACK!" (he wasn't too fond of the no food rule). And let's not forget when he opened the door to the locked bathroom and charged out into the hallway while mama was still going to the bathroom. Ah...fun times. At least they had a toybox that he could tear apart. The sweet joy on his face when he found a dolly inside was absolutely precious! Seriously, lady? My kid is 19 months old and you want to know why he's pissed that you're trying to feed him water through a newborn hospital bottle? 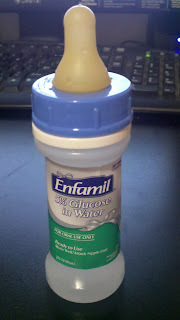 The kid hasn't taken a bottle in months - and when he did, there was never water in it. I have no idea why they didn't ask me beforehand to leave a sippy cup. 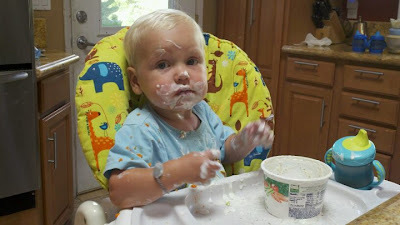 Anyway, they handed him off to me and he sucked back a couple ounces of milk from his sippy cup and then proceeded to thrash and scream for a good 20 minutes. He was PISSED. Thrashing, kicking, grabbing nurse's glasses, you name it. He was turning blue, satting 60's, the whole 9 yards. Turns out he doesn't come out of anesthesia too well. Typical Bodie. He put on quite a show. The nurses were all standing there dumbfounded, asking me "does he usually get mad? Why is he so upset?" I don't mean to be disparaging, really I don't - they were all really nice. It's just that they don't know Bodie like the nurses at CHLA do. I just had to laugh because I would expect nothing less of Bodie. He's strong, he's independent and he can't handle any loss of control. I finally got him to konk out, his sats came up and he got a good nap in. 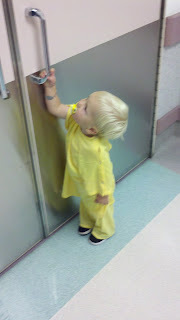 A half hour later, he woke up, lost his iv and hospital gown, gained back the Buzz Lightyear jammies, threw back a sippy cup and a half and a banana, flirted with all of the nurses (including the one whose glasses he had stolen an hour earlier) and we were on our way home. Thanks so much for all of your prayers for an easy and complication-free surgery! Much to Bodie's chagrin, he had his pre-op appointment with his pediatrician's office yesterday and everything checked out aok for Thursday's ear tube surgery. Looks like we're all set. The doc said Bodie looked incredible (the doc (not our usual doc) actually said as he signed into the computer system "whoa - this screen gives me an immediate complete medical history of Bodie, including infections back in summer of 2010. But it doesn't say he looks totally normal now. The anesthesiologist on Thursday is going to see this before he sees Bodie and be completely scared of what he's going to find!") Ha! We're used to the shock on doctors' and therapists' faces when they look at Bodie's record before meeting him. Nobody expects him to be as robust as he is after reading his file! In fact, he was in usual Bodie form (aptly described by a doctor last week as "a tornado with legs"), opening up the door to our exam room and marching up and down the hallway (in nothing but his diaper, of course - thank goodness I cloth diaper, so at least he looked cute! ), chanting "toy! toy! toy!" as he peeked into each open exam room to see if they had better toys than us. 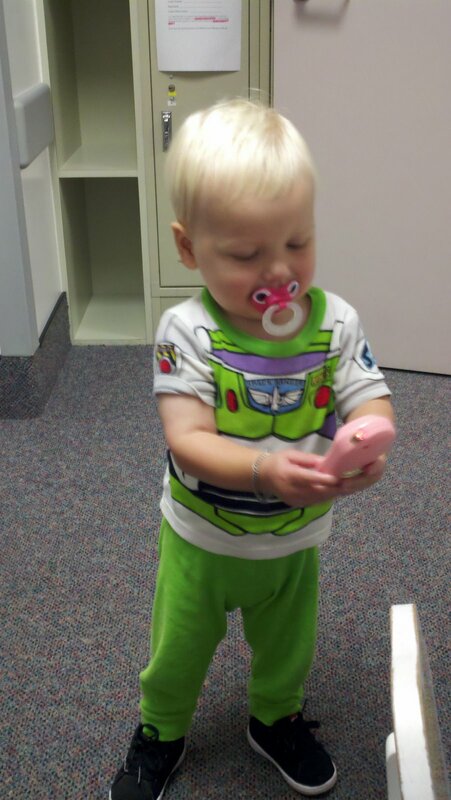 By the end of our hour wait for the doctor, he had pilfered every available toy and brought it back to our room! Meh, I figure it's what they get for not having more toys! Everyone was laughing at him. The only other thing of note was that apparently he had A LOT of fluid in his ears. Yep, it's a good thing we're doing the tubes! Here's hoping and praying the fluid doesn't turn into an ear infection in the next 2 days! (The doc didn't see any inflammation, but anything is possible, so please join us in praying for NO infection between now and Thursday!) We're set for sometime Thursday morning - they're supposed to call Wednesday night to give us a check-in time. Luckily, we got Sierra calmed down enough the hygenist was able to get in, clean and floss them and confirm that all looked good with NO cavities! YAY! Ha! Never a dull moment at the Bennett's! One year ago today, our sweet boy had his third open heart surgery, his Bi-Directional Glenn. That means one year, yes, one whole year now, without a surgery (after 3 surgeries in 7 months, that's kind of an exciting new record!!!). 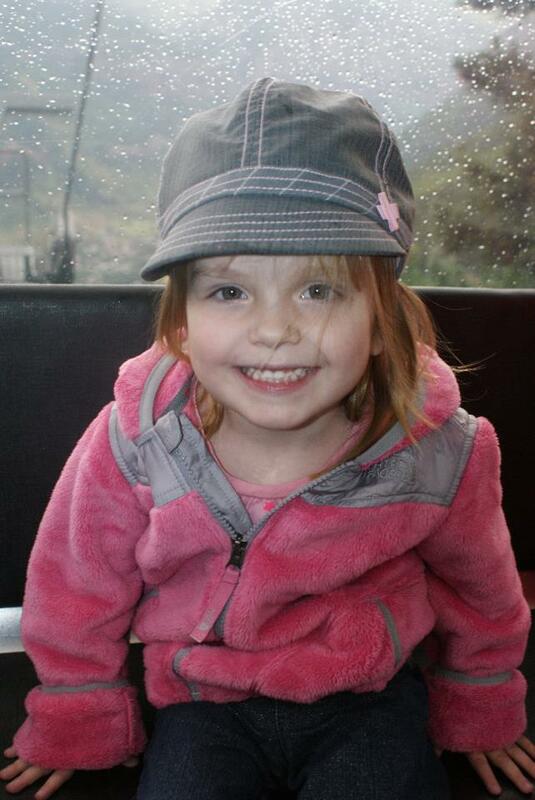 In other news, will you please keep baby Ella in your prayers? She was born this morning and has the same condition as Bodie (I've mentioned her mom Melissa before - she's from my hometown). She's doing well, but as you all know, she's got quite the fight ahead of her. 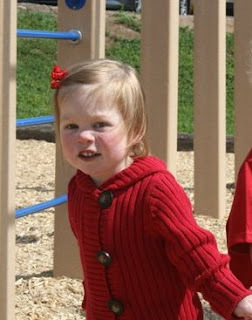 Please pray that she stays stable and has a smooth Norwood with no huge complications. Thank you! A little over 8 months ago, I met a heart mom due with a baby with the same condition Bodie has. 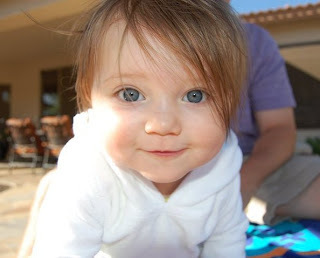 She was asking for advice and several of us been-there-done-that heart moms recommended purchasing some baby legs and side-snap onesies, since that's about all your baby can wear in a hospital setting. She went to Babies R Us and couldn't find either one. I remember reading her blog, feeling the sadness in her writing. All that she wanted was to buy something for her sweet baby and HLHS was robbing her of even that. I realized I knew where to get both side-snap onesies (only at Target, and only on a good day) and Babylegs (amazon or baby steals are your best bet). So I figured I'd pick some up and send them to her. An inkling of an idea was born. Just a teeny tiny seed in the back of my mind. What if there were other new, heart moms with the same problem? Who couldn't find these items us fellow heart moms earnestly told them they needed? What if somehow us, been-there-done-that moms, could help somehow? So I asked my fellow heart moms if they wanted to help me put together a little package that contained some of these harder to find items. Well, don't ever ask a group of heart moms to help you with a little project...unless you intend for it to have a life of its own faster than you can "please, can you help?" Within 2 days, Sisters by Heart was born - complete with a logo and a website. That was 8 months ago. To date, we've sent out over 90 care packages, which now include the original Baby Legs and side-snap onesies, along with bios of some of our thriving HLHSers, pacifiers, notepads & pens, antibacterial gel, lotion, adorable infant gowns with happy faces on them and "keep your hands off my kid" (but worded much nicer, of course) signs - all in a huge black bag with our logo on it (perfect for schlepping around the hospital). Our brochures are now in every top pediatriac cardiac ICU in the country. We're getting accolades from surgeons, from cardiologists, and most importantly, from the families we're helping. In the first few months of SBH's inception, the other moms started talking about filing as a 501(c)(3) charity. My first reaction was "no way, no how. Not gonna happen." I had formed a 501(c)(3) back in my lawyering days and it was a ridiculous amount of work. And I loved my job as the CFO of a nonprofit, but I watched the development department and thought fairly regularly "thank God I don't have to be on the money raising end. Man, that looks hard!" But...we started raising money...and started gaining momentum. And I started praying - and realizing God had brought me to this moment, with my specific background, for a reason. So I started rethinking things. To say that I am shocked, excited and proud is an understatement. From a little idea to a full-blown 501(c)(3) public charity in just 8 months is amazing. I am so proud to be a part of this amazing group of women and am so excited to see what's in store for this group in the future. Won't you please consider making a donation to further our work? Help us continue to give hope. It's so easy. Simply click here and click "donate" on the right hand side - your contribution will be fully tax deductible! Hey, what do you know? It sounds way more exciting when put to a children's song. But alas, I am not referring to plans to meander lazily down some river in a comfy inner tube, but instead am referring to the tiny plastic tubes to be placed in Bodie's ears later this month. Yes, Mr. "I have a crazy big vocabulary for a boy my age, but still can't pass a hearing test to save my life" has run out of chances and is scheduled to have tubes put in Sept. 22nd. He hasn't really had too many ear infections and doesn't have any vocabulary delays (the 2 single biggest reasons for tubes), but he has persistent fluid build-up and every single hearing test they've done in the past year has shown hearing loss (both the ones that require cooperation (like there's any surprise he'd fail those, right? This is Bodie, after all) and the ones that don't (just measuring sound waves through the ear canal)). So, his ENT has decided the long-term risk of persistent fluid build-up just isn't worth it and we've scheduled Bodie for tubes. I know tubes aren't that big a deal - I mean, I had 4 sets of temporary tubes, a set of "permanent" tubes, a tonsillectomy and adenoidectomy (and that was all before the age of 5!) for, say it with me now - "persistent fluid build-up and hearing loss." It seems that Bodie has inherited most of the worst of Dusk and my genetic traits - we were kinda hoping he'd catch a break on this one. No such luck. So, he's scheduled for pre-op testing with his pediatrician (less scary than it sounds - basically, just a physical) on Monday, the 19th and surgery for Thursday, the 22nd. And, just because it's going to be a fun week already, I decided to throw in a dental appointment for both kids on Tuesday, the 20th. Never a dull moment around here! 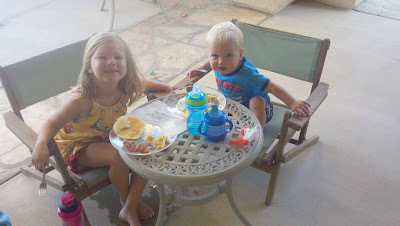 The kids enjoying breakfast out in Palm Springs this past weekend - one way we have peace and quiet at our breakfast table - giving them their own table! Everybody wins!